TweetThe Philadelphia Eagles have agreed to a 6-year, $100M ($40M guaranteed) deal with Michael Vick. Am I the only person who thinks the Eagles have lost their minds? Off the field, according to many published accounts, Vick has changed. Call me a skeptic, but I think we all need to wait 10-15 years before we give the benefit of the doubt to a guy who ran a dogfighting operation and either personally witnessed or personally killed some of the dogs. I hope he has changed, but I’m not ready to say it has happened because he’s played well on a football field and has said all the right things on camera. Now let’s turn to the football side of the equation. Last year, Vick stepped in and played extremely well, putting up big numbers, albeit against lousy defenses. But he only played 10 games where he started and finished, either subbing in or getting knocked out of two others and missing four entirely. He’s older and has been injured before and his style of play opens him up to taking shots, all factors to consider. To be fair, he missed only three of the four games due to injury and the fourth one because the Eagles’ playoff position was locked in. But look closer and you’ll realize their playoff seeding was set because Vick played terribly in a 24-14 home loss to the pathetic Vikings in Week 16. In that defeat, he threw an interception and lost two fumbles when the team was in scoring position, one of which was returned for a touchdown. In the playoffs, against the quality defense of the Packers, he struggled again, completing just 20 of 36 passes. With the game on the line, Vick positioned the Eagles for a game-winning touchdown, then threw a horrific interception on a pass intended for arguably his fourth best receiver. That doesn’t sound like a strong case for monster money. I’m not saying the Eagles shouldn’t have kept him and dealt Kevin Kolb. If Vick continues to play like he did last year, Philadelphia has a franchise QB for the next few years. But all things considered, to give this man a $100M contract, that’s just SICK! This entry was posted in Advertisements, NFL and tagged eagles, millions, nfl, nfl contract, vick. Bookmark the permalink. One Response to $100M for Vick? SICK! Vick is a bit of a conundrum – He has the arm-strength & is a pretty accurate thrower, but he still hasn’t (and probably never will) developed the instincts of a true QB. This move reminds me of the Vikes in the late 90’s when they opted to put their title hopes on the shoulders of Randall Cunningham. Vick has never been good in back2back seasons. As far as running goes, keep him in the pocket, and if he has to scramble, make sure to force him to his right, because he doesn’t have the nimble footwork to quickly get his body in position to throw against the grain, thus taking away the threat of a pass & making him one-dimensional. 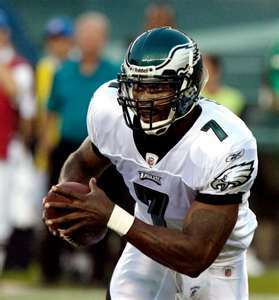 Vick, backed up by Vince Young could be a recipe for disaster. This is one of the best wait and sees in quite a while.